We can host 16 people in two dorms of 8. We then have 5 safari tents with two single beds in each. We could accept groups of up to 26 and would happily charge the same price of dorms for tents (discount of 500 per tent). Further people could stay in 4 private rooms each with one double bed and 1 extra single bed (max 3 ppl per room) and one fifth room with one double bed and a bunk bed (max 4ppl). In total we can sleep to the maximum 42 people. Welcome to Distant Relatives Ecolodge – a lush and enchanting environmentally conscious beach retreat nestled along an emerald lagoon, white sand beaches & an enchanting community. Join us diving, snorkeling, moonlit dhow sailing, on village walks, windsurfing, deep sea fishing, or simply come relax and mingle with travelers from around the world in our vast, green and leafy social spaces! Nestled between the Giriama village of Fumbini and the beautiful emerald waters of Kilifi Creek, Distant Relatives is both a message of optimism and an experimental model of environmentally and socially conscious living. Adventurers from around the world gather here to share tales of the road, mingle with the local community, and enjoy the beautiful ocean views and sunsets that Kenya has to offer. In just one hour’s drive from either Mombasa or Malindi you could be joining us for reef snorkeling trips, moonlit dhow sailing, village walks and beach bonfires, wild cliff adventures, and various live music events. 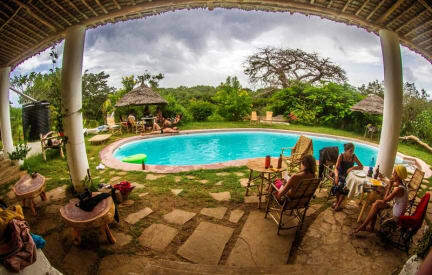 Distant Relatives is a new and unique ecolodge, hostel and backpackers, and an exceptional budget-friendly alternative to the classic hotels and resorts of the Kenyan Coast. Our accommodation options include camping, dormitories, safari tents, private rooms and beautifully designed ensuite bandas with their own charming private courtyards. Our kitchen serves some of the most delicious, mouth-watering and reasonably priced food on the coast. Wake up to the smell of local Kenyan coffee and go to bed after a full plate of fresh seafood pasta, grilled seasonal vegetables, or some of our signature Friday all-you-can-eat pizzas and free oysters! At Distant Relatives, our philosophy has always been to work around nature, rather than making nature work around us. For us, caring for the environment and supporting our community will always be a priority and a passion, and we are happy that such efforts have led to our recent certification by Ecotourism Kenya. Distant Relatives Ecolodge & Backpackers is staffed by a few travellers and a lot of locals ready with the best advice for your East African trip. In the spirit of Kenya’s tradition of generous hospitality, we look forward to welcoming you to our humble coastal shamba and making your stay in Kilifi the most memorable time you’ve had in East Africa! Loved this hostel so much, I've stayed here twice! The staff are friendly and helpful, especially Alice. The dog, Mowgli, is playful and will join you to the beach. The locals at the village will hang out and take you on adventures. Of all the locals, my favorites were Steve and Silvester who you can find on the beach, and Zion the boda driver who you can find at the front gate. Beautiful greenery everywhere, and especially loved the bamboo showers! What a perfect piece of paradise! Everything I wanted for a break from the city. Good vibes, great people, locals & travellers, the creek is nice to swim in especially at night where you can see the phenomenon of bio luminescent plankton - pure magic. There are handy volunteers organising fun things to do, dinners out, fishing and snorkelling. The music is nice and the bar has a great atmosphere for a nice, cold beer. Comfortable beds and clean facilities. Great seafood... I could go on. A haven surrounded by well-preserved nature, far away from city and road noises and hosting an international community and a very friendly staff. We stayed in the tents outside that were clean, comfy and with a view on the forest and monkeys roaming around. The beach is only 400m away from the lodge and there are traditional villages located on a cliff less than a kilometer away. Watching the sunset from there while eating freshly made food by the mamas is an amazing experience. A wonderful oasis to stay at in hopes of escaping the rest of the World's humdrum. Good vibes! People of all kinds mingle here to hang out and have a good time. It’s a place to make friends and enjoy good company. Chill by the pool, leverage the bar’s offers and run down to the beach for a night late swim in the glowing water (bioluminism). Distant Relatives definitively know how to party but the place is also perfect if you need to unwind and relax. The team is very friendly and helpful, they also offer several activities (sunset dhow, snorkelling, yoga etc.). The best hostel I stayed during my trip to Kenya, ambiance and facilities are super nice. The only annoying thing is that they have a lot of extra charges like breakfast, wifi, pool table, etc. which add up if you are not careful. Great staff and a beautiful hostel. They upgraded us from a tent to a banda for free, just because it was raining. The only thing that bothered me a little bit was that some evenings, there were some quite rather creepy men at the bar who persistently tried to buy us drinks even though we refused and in general got a little too close for comfort. Pretty sure they weren't guests of the hostel though because I never saw them the next morning. Maybe the hostel policy on visitors should be changed. Truly lovely spot in an authentic and not tourist over-run Kilifi with a pristine beach. Lovely staff and eco-hostel with great eco facilities. Loved the open-air bamboo showers. Very easy going with a busy pizza night every Friday that facilitates locals and backpackers to enjoy the place together with live music and good food and drink. Would definitely return and recommend :-) mercii x. Nice location and atmosphere, absolutely recommended! Probably one of the most beautiful hostels we‘ve seen so far and very nicely integrated into nature. All members of the communities around speak very positive about it. Apparently they do a great job with community engagement and sharing benefits. However, is not located at the open ocean but at a creek. The food was rather poor and pretty overpriced, especially the breakfast. Besides, it was the only place causing me severe stomach problems during our 6 week Kenya trip full of streetfood.